Wind farms in west Texas have been located in mountainous areas near Fort Davis, Guadalupe Peak, the mesas east of Fort Stockton, and near Big Spring and Sweetwater. That the initial investment in Fort Stockton was about $200 million. 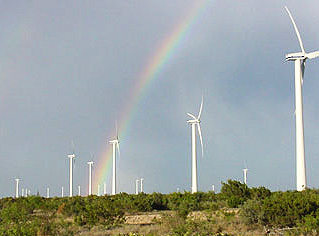 The Indian Mesa Wind Farm is located in Pecos County, Texas. The project was completed in 2001. One hundred twenty-five Vestas V-47 wind turbines produce up to 83 Megawatts of electricity. Electricity produced by the project is purchased by the Lower Colorado River Authority, Austin, Texas, and TXU Energy Trading Company, Dallas, Texas. The project is connected to the transmission lines of American Electric Power subsidiary West Texas Utilities. The project is built on land owned by local ranching families and by the University of Texas. The successful wind plant funded by Fort Stockton on I-10 in eastern Pecos County, and the plant near Big Spring generate revenue by selling electricity to electric companies. These funds are to pay the loan back within a few years. After the financing is paid off, the revenue would be a benefit, an income. Much of West Texas is suitable for wind farms since there is plenty of wind and a good infrastructure of high voltage transmission lines. Texas lawmakers created a hungry market when they wrote a law nine years ago that requires utilities to buy renewable power. On the federal level, a tax credit encourages investors to put money into wind power. 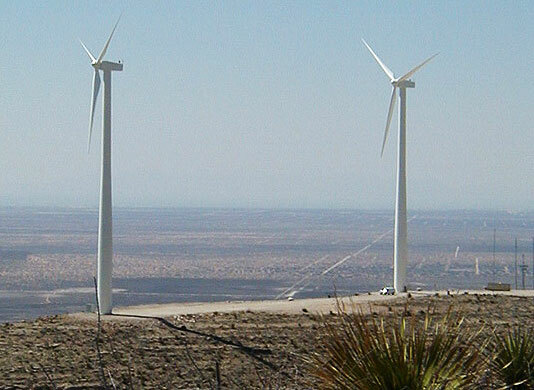 Located near the Hueco Mountains east of Horizon City, about 35 miles from the City of El Paso’s downtown district is a wind farm, El Paso Electric’s Hueco Mountain Wind Ranch. The first wind energy generating project in El Paso County. Resulting from customer suggestions that EPE acquire renewable resources and give customers the opportunity to voluntarily select renewable energy as a power source. The EPE Hueco Wind Ranch has two 660 kilowatt V-47 Vestas wind turbines. These Vestas turbines have 77-ft.-long rotor blades (154 ft. diameter) mounted on 213-ft. towers. 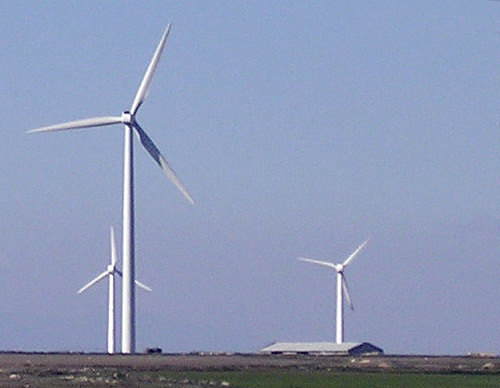 Built in Denmark, the turbines were shipped to the U.S. in January 2001. The top two sections of the three section towers were constructed at Bergen Steel of Canutillo, Texas, and the bottom section was built in Utah. The vestas 660kW wind turbines are expected to eventually generate approximately 3,000,000 kWh of electricity a year, which is equivalent to the energy needed to power approximately 500 average El Paso households. Wind turbines in this area will generate the most energy during the winter and spring months. Cielo Wind Power LLC was selected in January 2000 to develop this wind energy project at an approximate cost of $2.2 million. In December 2000, EPE contracted with Cielo Wind Power LLC to build the wind project and perform operations and maintenance services. Construction on the project began in late December 2000. This project serves as another example of profitable use of wind turbine technology. 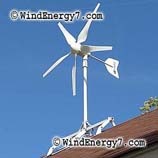 Wind turbines do not generate any emissions to air or water and do not produce hazardous waste. Wind turbines don’t deplete natural resources such as coal, oil, or gas, or cause environmental damage through resource extraction and transportation. The pollution-free electricity generated by wind turbine technology is helping to reduce the environmental pollution in the U.S. and worldwide. Today, Texas is the leading producer of clean renewable wind power. Texas has 4,112 megawatts of wind generation capacity as a result of their leadership and vision in wind energy since 1995. Today Texas wind energy projects are moving forward at a tremendous rate with another 1,478 MW of capacity under construction and 8,012 MW planned and announced. No other state has more deployed wind energy than the Lone Star state and at this rate, no-one will catch them either. Beginning in the year 2007, when both turbines are paid for, the Spirit Lake Community Schools district will have about $120,000 tax free income from the clean, renewable northwest Iowa wind to use to improve education for the children of the Spirit Lake Community School District. The visionary leaders at Spirit Lake Community Schools began studying the use of wind as a renewable source of energy for the district in September of 1991. Early in the study a partnership was formed with the Iowa Department of Natural Resources. The study revealed a strong indication of total investment return in 8.5 years. Once the vision was established, Spirit Lake Community Schools applied for a grant from the Department of Energy for three turbines; one each for the elementary, middle and high school. The high school was rejected because of the cost of the conversion necessary to switch from a different electrical phase. The middle school was rejected because the DOE does not fund new buildings. In December 1992, the elementary school received a grant for $119,000 for one turbine to supply electrical energy. Specifications for the wind turbine were prepared and three bids were received in the spring of 1993. The successful bidder was Minnesota Wind Power of Marshall, Minnesota with a bid to provide and install one wind generator at a cost of $239,500. To offset the additional cost not covered by the DOE grant, the project was funded by a low interest loan through the Energy Council of the Department of Natural Resources. 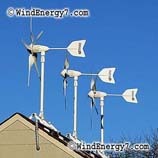 On July 22, 1993, the wind turbine on the lawn of the Spirit Lake Elementary School began producing electricity. Ninety months later, the school’s turbine had produced 1,570,000 kilowatt hours of electricity which would have cost the district $124,900. This is enough electricity for 264 average Spirit Lake homes for a year. In addition to providing all of the electricity for the 53,000 square foot elementary school, it also produced a reimbursement from the utility company of almost $25,000. The final payment for the loan on turbine was made during 1998, 3.5 years ahead of schedule. Today the almost $25,000 savings go to the school’s instructional program. The props turn whenever there is wind. It generates electricity after the generator turns at 1790 rpm, which requires a wind of around 7.5 mph at the 140 foot level. The system is being monitored constantly in several ways. The primary method is by computer from the office of the district’s Director of Buildings and Grounds, Mr. Jim Tirevold. The computer monitors wind speed, electricity being produced in real time for the day, in addition to cumulative totals. As of July 1, 2004, the turbine has generated on average 312,309 kWh of electricity annually. To generate an equivalent amount of electricity, it would take 549 barrels of oil or 156 tons of coal. It would take 285 trees to absorb the carbon dioxide emitted by this oil or coal. There is no storage capacity. During peak demand and /or low winds the district purchases electricity from Alliant Energy and during excess production, Alliant Energy purchases electricity from the school. The district utilizes net billing. Currently, if the district uses less than what is produced Alliant will purchase the excess energy for 6.02 cents. If the district uses more than produced, Alliant sells to us for 8.5 cents. In addition to its excellent financial success, the school’s wind turbine has been used in school classes as an educational tool and it has made a significant contribution to the environment. The district has had over 400 visitors since that warm day in July of 1993 when the turbine began producing. A number of schools in the area and their students have shown particular interest in the project as they study the use of renewable sources of energy. Once it was established that the wind turbine had indeed been a great success and asset to the district, plans went quickly into effect for the second turbine. On October 29, 2001, the NEG Micon 750 KWH tubular tower turbine became operational and was well on its way to providing power for the entire school district. The NEG Micon has an anticipated life span of 30 years. It stands 25 feet taller than the original turbine on a 165-foot base. The wingspan is almost double the size of the Windworld turbine at 157 feet in diameter compared to 87 feet. The size of the rotor diameter is approximately that of the wing space of a DC-10 jumbo jet, and it is designed to withstand hurricane type wind speeds of 131 mph. The new turbine will not only provide energy for all of the remaining school facilities and athletic fields, but also an additional educational resource for Spirit Lake students. The district borrowed $780,00 to complete the installation of the turbine, and anticipates a 6 V2 year pay back period. The energy bills offset each year equal approximately $118,000, which can be used for other district programs after the 6 V2 year period is complete. The financing of the turbine included a $250,000 no-interest loan from the Iowa Energy Center and a $580,000 Iowa Department of Natural Energy loan from a commercial bank with interest at 5.1%. 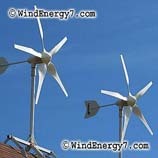 School District in Illinois purchasing wind turbines? This Illinois School District is considering the purchase wind turbines. In Popular Grove Illinois, The North Boone Community Unit School District is seriously considering wind turbines for rural campus. The district has been studying wind energy as a way to reduce its energy costs. Ward says turbines would serve an educational purpose and save the district tens of thousands on energy costs. 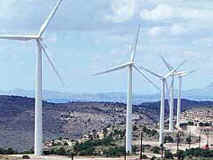 Students could study wind power and learn about renewable energy. Wind turbines and alternative sources of energy are very relevant to students today. Don Ward, the school board president has found that one to three wind turbines can generate electricity to power the district’s four buildings. Many school districts in Illinois have already installed wind turbines, North Boone is hoping to follow suit as well as many other Illinois schools. Ward says the installation of wind turbines can cut the districts energy costs and utilize renewable energy. In a rural area just north of Poplar Grove, the schools lie in a good location for wind turbines. Since the campus isn’t in a suburban area or city, Ward said wind turbines would be able to work well because they would be placed in a setting capable of producing viable wind power. The strongest winds blow from September to June aligning with the school year calendar. Though wind turbines are expensive — a large one costs anywhere from $1.5 to $2 million while smaller ones cost upwards of $250,000 — Ward said they have a seven-year payback on the district’s investment and would save the district thousands of dollars each year in energy costs. The district currently spends $150,000 a year on electricity. Wind turbines generally have a 20-30 year life span making them a quick payback and good investment financially. At an annual conference of school board members in Chicago the shool district heard about others investing in wind energy. At this conference, many schools in Illinois gave presentations on their wind turbines, this started the school board thinking turbines would be a good investment for the district.